Save 15% off using this Express coupon your next Express shop visit. 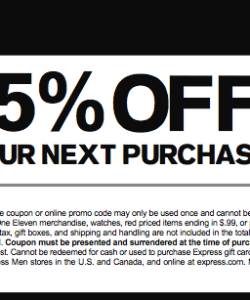 Only at the clothing store, express can you use this coupon to save 15% off anything in store… anything! Yea, you want shoes? Got it! You want a jacket? Yup! How about a leather belt? It’s yours! All at 15% off your entire Express store purchase. Express is always releasing great coupons, but never this much off! So grab the shopping coupon for Express today and save big… except on red tag items, you know that!